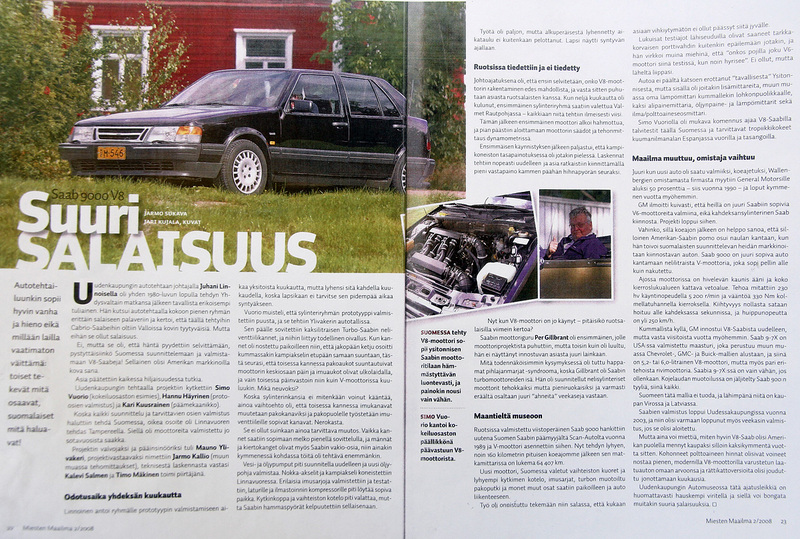 I have written about the Saab V8 engine before. But as I came upon some more detailed information of the history, design and construction of it I wrote an article about it in the IntSaab2011 magazine. I actually went to interview the chief engineer Mauno Ylivakeri who was the V8 project supervisor at the Valmet Linnavuori engine plant. Just before Christmas in 1987 presented Juhani Linnoinen, Director of the SAAB-Valmet Uusikaupunki car factory, a special request to Valmet Linnavuori engine plant (today Agco Sisu Power). 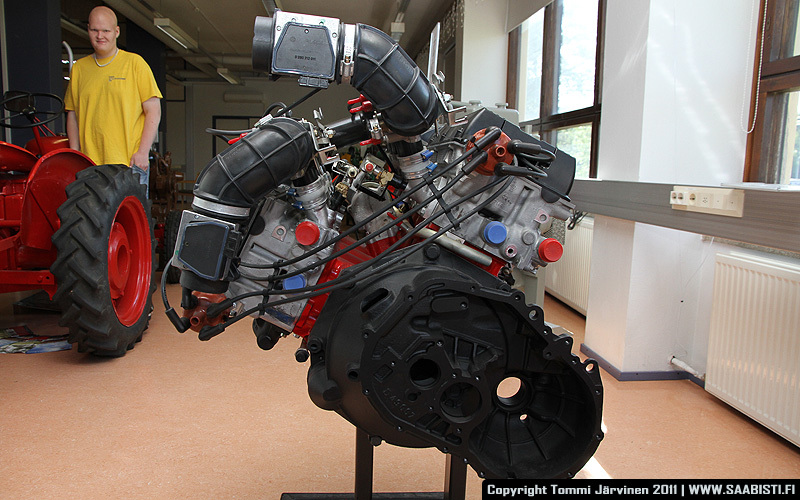 “Could you make a V8 engine for a SAAB?” Linnoinen asked. “Well of course – this is an engine factory after all”, replied chief engineer Mauno Ylivakeri from Linnavuori without hesitation. Thus began a top-secret engine development project, which wasn’t made public until 10 years after the project was finished. Linnoinen had the idea for a SAAB V8 on one of his trips to United States. People loved the SAAB 900 Cabriolet in the U.S., but thought that two-litre inline fours were better suited to lawn mowers – even if they had a Turbo. Linnoinen’s vision was to design and build V8 SAAB for the American market in Finland. Quietly, the matter was investigated. At Uusikaupunki car factory only three men were assigned to the project – test department manager Simo Vuorio, Hannu Häyrinen from the prototypes department and chief mechanic Kari Kuusrainen. At the Linnavuori plant Mauno Ylivakeri was selected as the project supervisor and chief engineer. Here too only three men were selected to the development team – chief designer Kalevi Salminen, development team manager Timo Mäkinen and Jarmo Kallio, who was responsible for testing. To maximize security, the team was locked into a small room in the office building’s basement, where the door had no markings. Cost factors meant that the aim was to use as much as possible existing SAAB parts, which would bring down the price of the engine. The drawings were finished quickly and the engine blocks were cast at the Valmet foundry in Rautpohja. SAAB Turbo 16 valve cylinder heads were then fitted on top. This is where the team had a real revelation, made possible by the construction of the SAAB cylinder heads. If you pointed the heads the same way, so that timing gears were on the same side, it meant that one head would be positioned correctly but on the other side the exhaust ducts would face inward and the intake ducts outward. This, obviously, would not do. Instead of manufacturing a custom head, which could have made the production costs unsustainable, there turned out to be a simple solution. 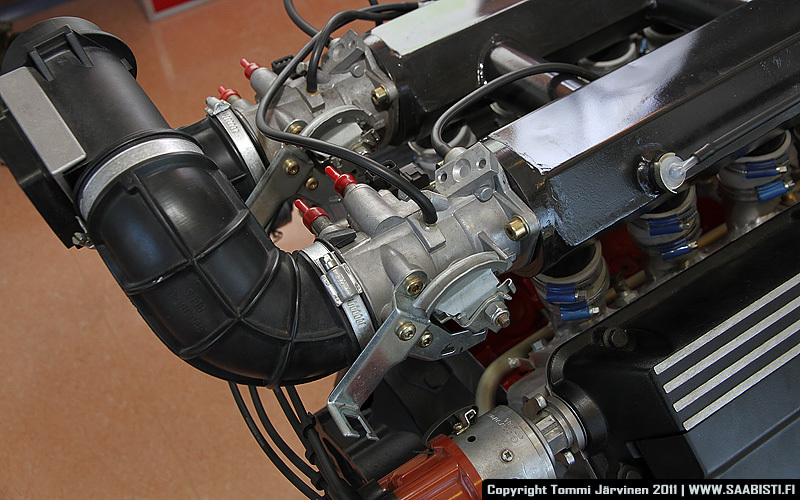 On the problem head intake ducts were converted to exhaust ducts and vice versa. Pistons and connecting rods were regular SAAB parts. Crankshaft was machined at the Linnavuori plant. Clutch and gearbox casing was custom cast, but the gears were all SAAB. 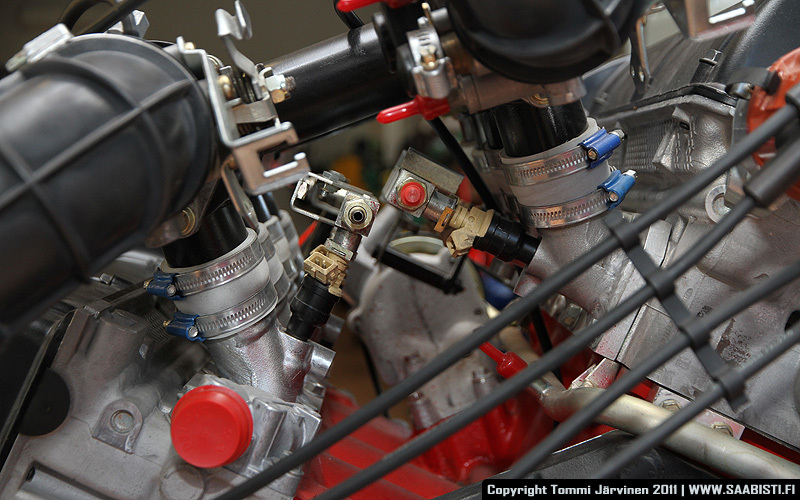 Many other parts – such as water and oil pumps, and the oil sump – required small changes. Five complete engines were assembled. Parts were made for ten in total. The first engine was run on a test bench for a long time, according to Ylivakeri “it was well and properly punished”. The engine endured the tests without any problems. The only issue during the test runs was a slight crankshaft vibration. It was solved by installing small counterweights on the crank – The same way V8 engines are balanced today. In the end though, Linnoinen’s vision was not meant to be. The engineers that got to drive the car praised it and the comments from the Swedish headquarters were moderately positive. There probably were some egos bruised though – after all when Linnoinen had presented the project at the Swedish headquarters, it had been brushed off as “impossible”. Apparently the engineers had investigated the idea and come to the conclusion that there was no way a V8 would fit in a Saab 9000. At the Linnavuori plant plans were made to expand the factory to start production of the V8 engine but ultimately there were two major reasons that the project was closed down. The V8 was not particularly fuel efficient and as such fit poorly to SAAB’s philosophy of making small, powerful and fuel efficient Turbo engines. This is why, for example, SAAB’s engine guru and father of the Turbo, Per Gillbrant, was not enthusiastic about the project. In addition, SAAB’s economic situation was poor. GM first bought a 50% share of SAAB, and later the whole company. The V8 was also introduced to GM but it had just built a V6 engine plant in Wales and an investment in a second engine plant was not relevant. The SAAB 9000 V8i is currently on display at the Uusikaupunki car museum (it has been driven approximately 65 000 kilometres in total), along with one of the test engines. Another test engine is on display at the Linnavuori plant museum. Rest of the engines and all the parts were sent to Uusikaupunki factory when the project was closed down – they have completely disappeared and according to most sources were destroyed when Saab 9000 production ended. 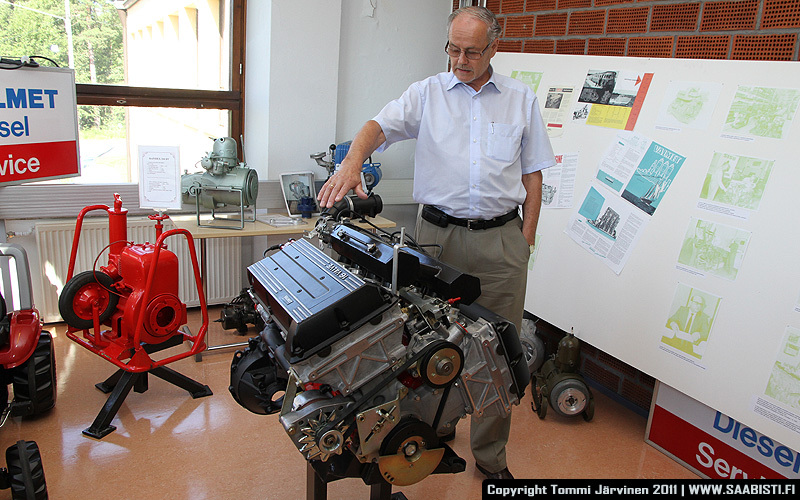 Mauno Ylivakeri and the Saab V8 prototype engine. 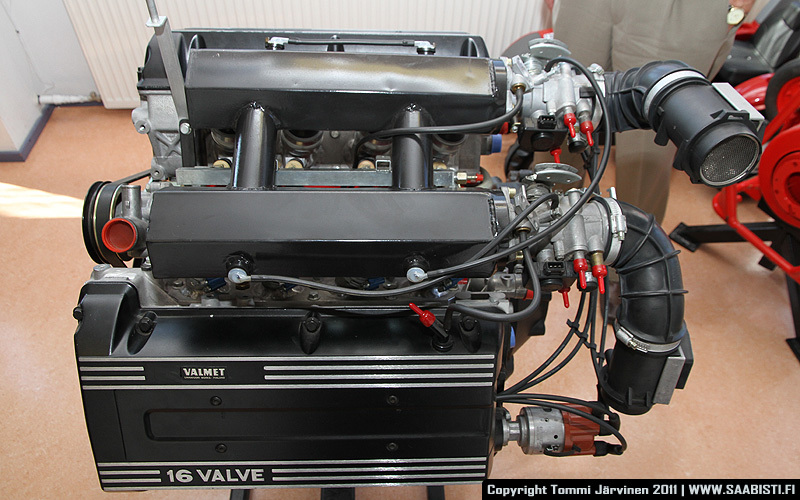 Engines were made by the Valmet Linnavuori factory. I want one and where can I buy one (and I am talking about the engine) I have a 9000 that needs an engine and I already have a 1999 93 turbo (that I am currently trying to get it to a shop so I can drive my baby back on the road, trying to save enough money for the repair on the body) in storage. Interesting story and it *may have fitted the American consumer needs at the timem however a front wheel drive V8 car would have been rather front heavy no? Lastly the Saab B series engine started it’s life as a Triumph V8 engine, chopped in half (hence the slant 4 configuration). So this project is going back to the roots of that engine really.